When tankless water heaters first came out they were known for certain minor mishaps, such as short bursts of cold water. There were only a few companies that could offer brilliant performance and low running costs and Navien was one of them. Present on the market since 1978, Navien products are among the world’s most efficient, energy saving, and CO2 reducing tankless water heaters. The Navien NPE 240a is the premier tankless model from a trusted brand and offers advanced technology to solve some of the common pitfalls of tankless water heaters. Who is the Navien NPE-240a perfect for? Property owners looking to reduce their energy bills. 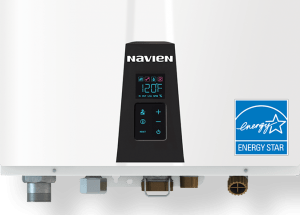 If the Navien NPE-240a does not seem like the right fit for these reasons, we recommend you check out the EcoSmart Eco 11 or one of the Rheem tankless water heater models. Sometimes, when we’re thinking which product to buy we only take the performance into consideration. People tend to consider a product’s amazing features, but don’t always consider if a product is difficult to use. Luckily, the Navien NPE-240a combines the best of both worlds – great features and user-friendly design. Navien is one of the only hot water heater manufacturers to offer mobile apps to control their water heaters. 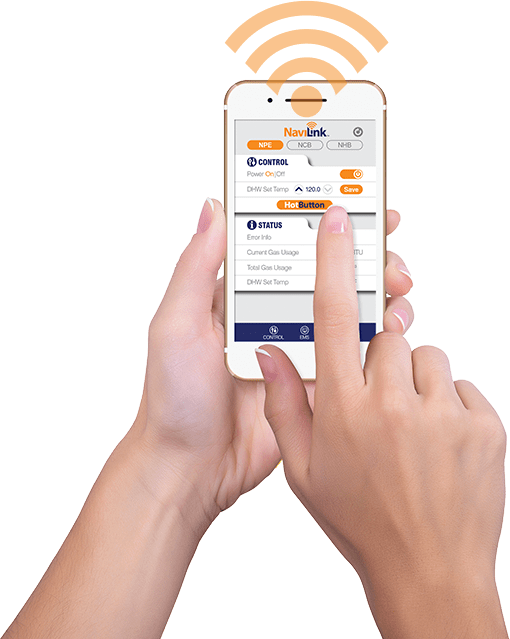 With the Navilink app you can control your water heater from anywhere in the world – turning it on or off, adjusting the settings, and monitoring your water heater for errors or any issues. 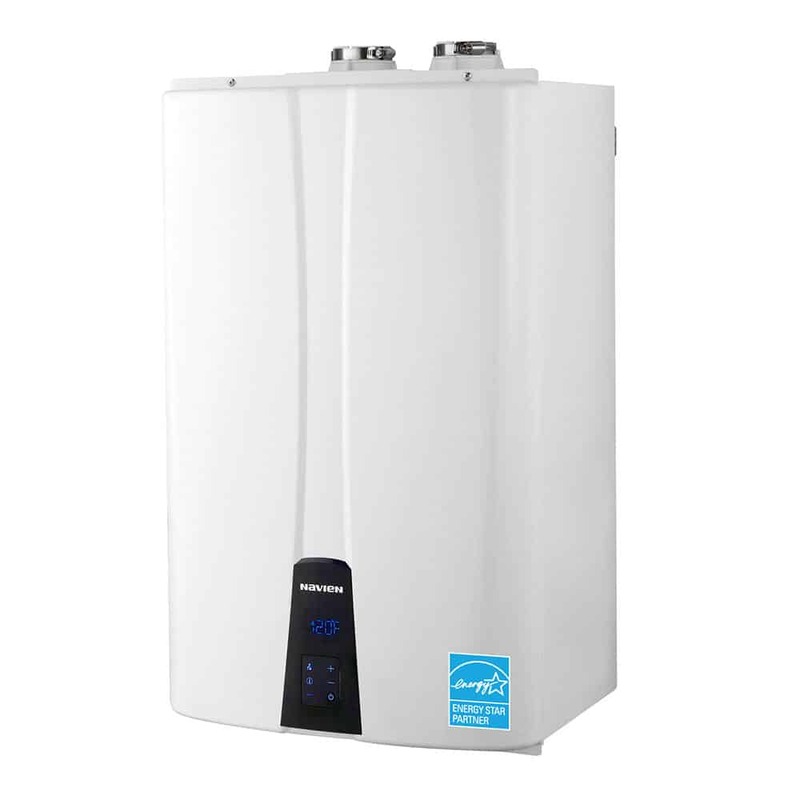 This makes the Navien NPE-240a a great tankless water heater for vacation homes or other properties where you can’t monitor your appliances on a daily basis. This water heater doesn’t come with a knob for adjusting the temperature but with arrow buttons instead. And, of course, above the arrows is a screen letting you know the heater’s temperature. The heater comes preset to output hot water at a temperature of 120 ℉. Depending on how far away your water heater is from your fixtures, you might want to adjust that up or down to get a comfortable temperature. Thankfully with the electronic controls, it is a cinch to use this water heater. Out of all water heaters Navien has produced, this one is the most powerful thanks to its massive flow rate of over 12.2 gallons per minute. Even though Navien products are designed for residential use, this particular unit could meet the needs of some commercial users. If you’re wondering how powerful this tankless water heater is, let’s just say that it can supply enough water for seven bathrooms plus all the sinks which you may need for some day-to-day chores. What is even more amazing is that this unit delivers truly on demand hot water with no lag. A heat exchanger is one of the most important parts of a tankless water heater and it operates under harsh conditions. It’s responsible for transferring energy and actually heating the water. Not only does it have to tolerate all the mechanical and thermal stress, it also has to withstand the effects of corrosive substances. If you want a heat exchanger to last for years, you need to make sure that it’s both efficient and well constructed. That is why Navien decided to use a stainless steel exchanger. Even though stainless steel costs a bit more than other materials, it gives the heat exchanger a longer lifespan. Stainless steel is also incredibly efficient in exchanging heat, which helps the Navien NPE-240a reach market leading 97% energy efficiency. While the majority of water heaters can help you reduce your energy bills up to 20%, Navien takes these numbers to a whole new level thanks to the ultra-condensing efficiency. In addition, as soon as you turn off a water faucet, this water heater will shut down as well. This guarantees no standby heat loss and makes Navien NPE-240a have a ridiculously low running cost. Many companies now make advanced technology a part of their products. For example, Navien NPE-240a uses an intelligent preheating technology. This means that Navien tankless water heater can recognize your daily patterns of hot water usages and make sure to heat water even before supplying it to the fixtures. This helps keep the unit energy efficient while also making sure you get hot water where you need it, when you need it, without that “cold sandwich”! Navien provides a warranty for its products but it is important to check out the manual to see how much coverage you get. In general, most parts of a water heater have a five-year warranty, whereas more expensive parts may have a warranty of up to 15 years. Navien heaters are often set at 120 ℉, but the temperature can be increased up to 160 ℉. Typically, the ideal temperature is about 140 to 145 ℉. As already mentioned, the flow rate of this product is massive. But, to be more precise, this Navien heater has a flow rate of 11.2 GP at a 45 degrees temperature rise and 12.2 GPM at 35 degrees rise. Should I buy the Navien NPE-240a? The Navien NPE-240a is a tankless heater definitely worth buying. It is suitable for all home sizes and all climates, but performas particularly well in properties that require a high flow rate. With its ComfortFlow technology that makes sure its users never have to experience the “cold water sandwich effect.” It’s easy to use, with its digital screen instead of a knob. And on top of providing you with on demand hot water, this unit can also help you to reduce your energy bills! If the Navien NPE-240a is overkill for your property, we recommend checking out the EcoSmart Eco 11, a great value for smaller homes, or one of the Rheem tankless water heater models.